The disciple Jesus loved was sitting next to Jesus at the table. Simon Peter motioned to him to ask, "Who's he talking about?" So that disciple leaned over to Jesus and asked, "Lord, who is it?" Jesus responded, "It is the one to whom I give the bread I dip in the bowl." And when he had dipped it, he gave it to Judas, son of Simon Iscariot. When Judas had eaten the bread, Satan entered into him. Then Jesus told him, "Hurry and do what you're going to do." Part of me wants to shout at Jesus, "No! No! Stop him. You can stop him!" But, you see, in a sense he can't stop him. 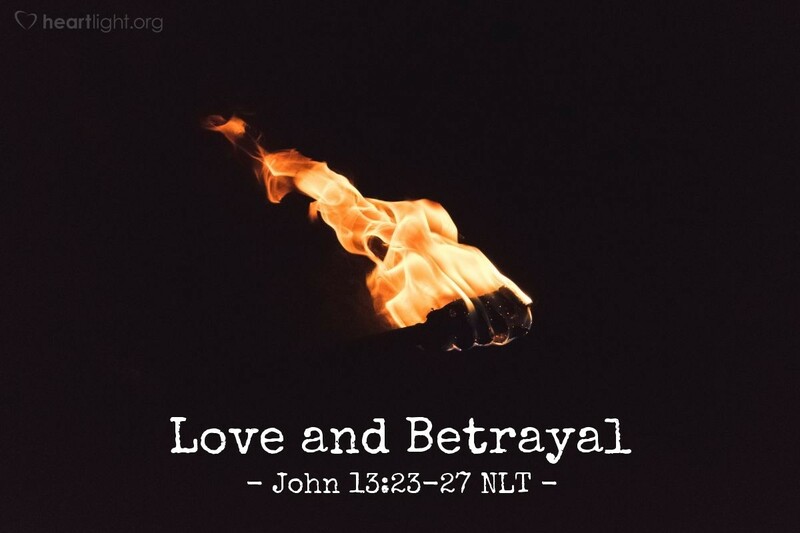 Jesus will not abuse his power to make Judas remain loyal. Jesus has warned him. He has declared the truth. Judas must respond. Jesus won't trap him or overwhelm him or force him to remain loyal. Love must be offered voluntarily, or it is not love. Following must be offered willingly, or it is not discipleship. Jesus will not make us follow. He will not make us reject Satan's knock at the door of our hearts. We must choose Jesus because we have caught a glimpse of his love for us. Do you love Jesus enough to make that choice? Almighty God, I cannot fathom the intricacies of grace, free will, predestination, and faith. I do understand, however, that you want my love to be a response from a heart of faith and gratitude. Better than I know myself, dear Father, you know that I offer you my heart willingly, without fear or question, because of all you have done to save me. In Jesus' name, I pray. Amen.